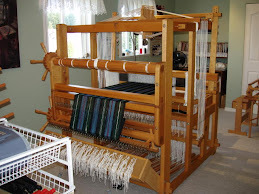 Well, my warp is on and I'm weaving but there's no way this will be done before we leave! It's a 'tromp as writ' and one I have used before ( love my record & sample books!) The images under the draft is a sample from my project in 2005 and how it turned out, showing front and reverse. I wanted something more elegant this time and finer threads. I imagined the towel on a bathroom vanity as some one's *special* guest towel and it should reflect that. The first towel (above) I used 2/40 linen as weft and the denting (3 per dent in a 12 dent reed) makes it look streaky. It will wash out eventually but it had me double and triple checking for threading errors due to the way it bunches certain groups of threads together. The second towel, I used a cream 2/10 mercerised cotton as weft. There is that neat interplay of pattern against the light and it's lovely, but it did not photograph well at all, no matter what I tried. Blogger tends to somehow darken pictures and so I had to pass on posting one of those shots. The weft is 2/16's in a medium beige and I think I will do a few of these in this colour. I have to choose weft yarns that are absorbent and be smooth yarns to show the pattern. I want fairly neutral colours as well. It's funny that no matter how large your stash is, at a time like this, you find it lacking! The weaving exchange is for the Guild of Canadian Weavers and this is the third year I have participated. The first was tea towels using authentic Scottish registered tartans, and last year was woven inserts and greeting cards. The variety is amazing! Whether its the yarns, pattern or colours used; it's all quite unique and a lot of fun to get in the mail in November. .. and being 'hi-def', it shows every zit, wrinkle and chin hairs. I better hit the spa while away! See you in a couple of weeks time.... 'Happy Weaving!"